When you�re sailing on a run, one of the best tactical tools your have is your wind shadow. This area of disturbed air flow may extend many boatlengths in front of your boat and can be used to slow down or control boats that are ahead of you. Because of this, downwind legs are great places to catch and pass other boats. The wind you feel while sailing is called your apparent wind. In simple terms, it�s a vector sum of the sailing wind plus the wind created by the boat�s movement through the water. On a run, your apparent wind is usually farther forward than the true wind, and its velocity is almost always less than that of the true wind, sometimes substantially. Because of this, it�s often hard to feel subtle changes in the wind when you are sailing downwind, so you have to be especially alert. In order to use your disturbed air advantageously, however, you have to understand the nature of wind shadows. Many factors affect the size and shape of the area of �bad air� that is cast by a sailboat. But the most important thing to remember is that wind shadows extend away from boats in the direction that�s opposite to their apparent wind. 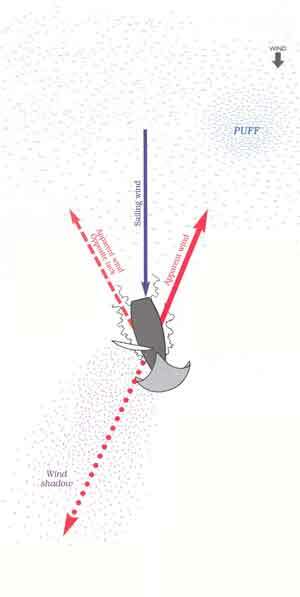 A boat�s apparent wind is the wind her crew feels while sailing. It�s a combination of the sailing wind and the wind created by the boat�s movement through the water. Because the apparent wind direction is almost always shifted forward relative to the sailing wind, wind shadows do not extend directly downwind (i.e. to leeward) of boats. Instead, they angle farther aft than most sailors think. That�s why when you want to slow another boat with your bad air, you usually have to position yourself farther forward than you expect. Understanding the nature of wind shadows is obviously important when you are behind other boats and trying to catch up. But it may be even more critical when you are ahead of other boats and trying to keep your air clear. 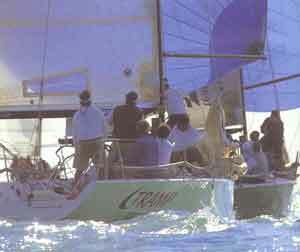 In this photo, the trailing boat has positioned herself almost directly between the lead boat and the true wind direction. However, because these boats are moving at about eight knots, their apparent wind is fairly far forward, and the lead boat easily has her wind clear in front of the trailing boat. When sailing downwind, you usually have to position yourself farther forward than you think to affect the wind of boats ahead. The wind you feel while sailing is called your apparent wind. In simple terms, it�s a vector sum of the sailing wind plus the wind created by the boat�s movement through the water. On a run, your apparent wind is usually farther forward than the true wind, and its velocity is almost always less than that of the true wind, sometimes substantially. 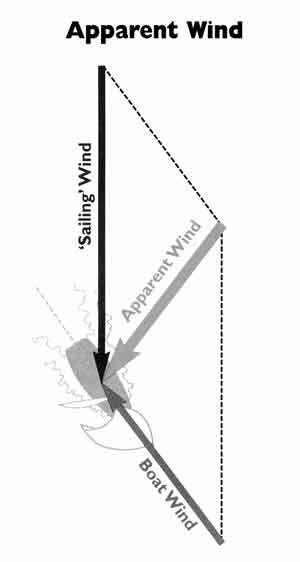 Because of this, it�s often hard to feel subtle changes in the wind when you are sailing downwind, so you have to be especially alert. Locating Wind Shadows Wind shadows, like the wind itself, are invisible, so you have to look around for clues in order to know where they are. Your best tool is undoubtedly the wind indicator on top of your mast (or on the mast of a boat to windward). This pennant shows the apparent wind direction and will give you a very accurate idea of which way the boat�s wind shadow extends. In addition to determining the angle of the wind shadow, it�s important to know its size. There are many factors that affect how large an area is covered by a boat�s disturbed air. These include the wind velocity, height of the mast and speed of the boat. The length of a wind shadow is often measured in �mast-height� units rather than in boatlengths. For example, in heavy air a boat�s wind shadow might extend four mast-heights to leeward. In light air, that same boat might cast a wind shadow for eight or more mast-heights. Even if you understand the shape of orientation of wind shadows in theory, this won�t always work in practice. Often when it seems you should be in another boat�s bad air you aren�t, and vice versa. So keep looking for signs while you are racing. Sometimes, for example, you can see or feel bad air in your sails. When a boat is coming from astern, the first thing you may notice is a flutter in the leech of your main. If you are catching another boat, your spinnaker luff may go soft first. The ultimate measure of clear air, of course, is your speed relative to other boats, so keep a close eye on this. If you are going fast, then bad air is probably not a problem. But if you start to slow down, think about wind shadows. � The �sailing wind� is the wind in which you sail. It�s a combination of the true wind and the wind created by current. The sailing wind is what you feel on a boat that is floating in the current but not moving through the water. The wind ripples on the water surface are coming from this direction. When sailing downwind, any puffs or lulls that you see in this direction will probably pass astern. � The wind pennant on top of your mast points in the direction of your apparent wind. This is the direction from which you will get puffs and lulls. It�s also the place to look when you want to know if you�re getting bad air. If your wind pennant is pointing toward another boat, that�s usually not a good thing. � When you jibe, you will have the same apparent wind angle on the other tack. This line shows where your puffs, lulls and clear (or dirty) air will come from on starboard tack. � The length, shape and density of your wind shadow will depend on a number of factors including the wind velocity, sea state, your sailing angle, the shape of your sail plan and your boatspeed. For example, wind shadows tend to be larger and more severe in light air than in heavy air. � This is the reciprocal of your apparent wind. It shows the direction in which your wind shadow extends away from the boat to leeward. On a run or reach, this direction can be quite different from the reciprocal of the true wind.